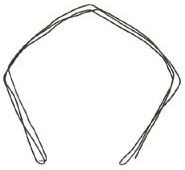 This brass wire frame (Museum of London collection) for stiffening a peaked bonnet is an excellent clue to understanding the foundations of the gable headdress. The Museum of London also has multiple leather shoes circa 1500 on display, although I only see this one online. I need to find references (assuming some exist) for extant specimens of the belt hardware seen in so many brass rubbings. There is a little jewelry remaining from the time, and pins for holding gowns closed, but most other details of costume must be gleaned from secondary sources such as artwork.